Wrangler Filtered Cigars are well known for their supreme quality being produced from the best tobacco farms in the US. The premium tobacco leaves used in each Wrangler Filtered Cigar gives this unique smoking gems an herbaceous, mild and woodsy taste. The aroma of these premium filtered cigars are so pleasant that even the most selective smokers will fall for them. Wrangler Filtered Cigars are very easy to light and have an even mellow burn. Wranglers are world renowned for their flavor consistency and optimum construction. Wrangler Filtered Cigars are distributed nationwide by Sunshine Tobacco Inc. located in Miami Florida. USA. Each of these discount filtered cigars are available at our online tobacco store in unique styles to choose from. Full Flavor, Lights, Ultra Lights, and Menthol. Our online filtered cigar store offers great deals and inexpensive ways to save money on over-prices retail brands. 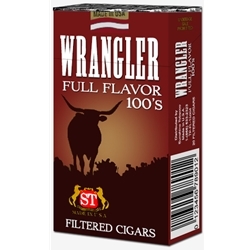 Wrangler Filtered Cigars offers an excellent choice for your smoking needs. Smokers Discounts has made it easy and affordable to buy filtered cigars online. Call us for more details!